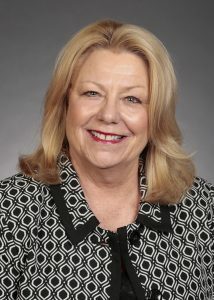 New rules being pushed through by Senate Republicans would eliminate the requirement that subcommittees be open to the public and that notification of the meetings go out 24 hours in advance. 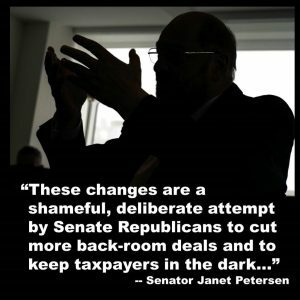 These changes are a shameful, deliberate attempt to cut more back-room deals and keep taxpayers in the dark about what they are doing. We are concerned that for the past two years, the Governor and legislative Republicans have pushed everyday Iowans to the back of the line. Republicans have allowed millionaires, big corporations and out-of-state MCOs to cut to the front of the line. Our goal this session is improve the lives of everyday Iowans. 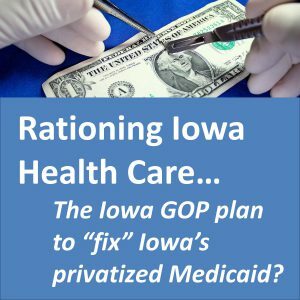 A partial review of the Medicaid privatization disaster is a big pile of excuses with no good answers for Iowa taxpayers who are being ripped off. 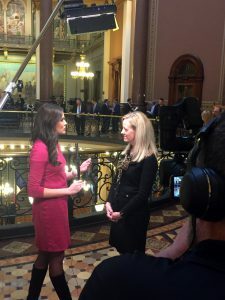 Departing State Auditor Mary Mosiman is one of a long line of Republican politicians who still cannot answer simple questions about the cost and quality of privatized Medicaid. 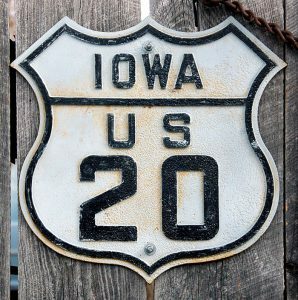 "Safe, efficient roads for Iowans, travelers and commerce have been top priorities over my last eight years on the Senate Transportation Committee. We’ve accomplished a lot in that time through bipartisan efforts focused on making Iowa the best place to live, work and do business." The fiscal mismanagement by Governor Reynolds and legislative Republicans is like a slow train wreck for everyday Iowans. It’s no wonder that Iowans are clamoring for new leadership that will put their needs ahead of the self-interest of Wall Street corporations, special interests and millionaires. The Governor is cheering today because there's still money in the state's bank account. That would be great news if she and the Republican-controlled Legislature hadn't slashed funding for job training and higher education, reduced protections for seniors and other vulnerable Iowans, and made health care less accessible for thousand of Iowans. Dems: How can we stop the increase in Iowa suicides?